Here are some facts about Richard Arkwright. 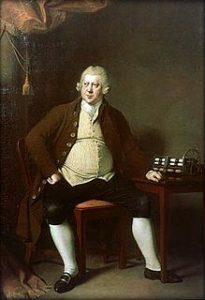 Richard Arkwright was born in Preston, England on 23 December 1732. He was one of the key inventors and businessmen during the early stages of the Industrial Revolution. Many people believe that he is the architect of the modern factory system. Richard was the youngest of seven children. Thomas Arkwright, his father, was a tailor. When he had completed his education -Thomas was taught at home by his cousin, Ellen- Richard became an apprentice barber and wig-maker. When his apprenticeship was over, he set up on his own as a wig-maker. He invented a waterproof dye for wigs and this made him a good income. In 1755, Richard married Patience Holt. They had a son, Richard Arkwright Junior. Unfortunately, Patience died in 1756. In 1761, Richard married Margaret Biggins. In 1769 Richard Arkwright patented the spinning frame (later called the water-frame), a machine to produce inexpensive spun cotton. In 1771, Arkwright and his business partners built the first water-powered cotton mill at Cromford in Derbyshire. 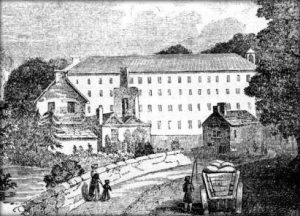 In 1776, Arkwright constructed a larger mill at Cromford. He then built other mills at Wirksworth and Bakewell. The Cromford Mill employed more than 1000 people, many of whom had been relocated by Arkwright from outside of the Cromford area. Many of the employees were children, some as young as ten. In 1786, Arkwright was knighted. Arkwright died in Cromford on 3 August 1792. He was 59 years old. In 1788, Sir Richard Arkwright purchsed a plot of land from Florence Nightingale‘s father. He started to build Willersley Castle, but due to a fire which resulted in much rebuilding, Richard Arkwright never got to stay. The castle was only completed after his death. What next? Learn more about some other famous inventors.